About 200 shanties were gutted to fire which claimed one life this afternoon in the slum area close to Shahbad Dairy in south-west Delhi. Delhi education minister Arvinder Singh has reiterated stand of the Directorate of Education that fee hike in schools would be effected only after approval in the meeting of parents teachers association (PTA). Only 165 candidates are left in the fray after final scrutiny of their nominations today. A total of 222 candidates filed nominations. The soaring temperature and heat wave have not deterred the spirits of the two prime candidates in East Delhi parliamentary constituency, which is one of the most underdeveloped regions of the Capital. Campaigning in the narrow streets of Hauz Khas village today, Congress candidate from New Delhi constituency, Ajay Maken, stressed that by incorporating special provisions for urbanised villages in the Delhi Special Laws Bill, he had saved the residents from the threat of sealing and demolition. The state BJP has accused the Congress of indulging in caste-based politics. It says this is reflected in an advertisement sponsored by the Congress. The advertisement published in a Hindi daily on behalf of the Saini Samaj appeals to the Kushwaha, Shakya, Maurya, Mali belonging to the Saini Samaj to vote for the Congress in violation of the poll code, alleged the BJP. Bharatiya Janata Party candidate from West Delhi parliamentary seat, Jagdish Mukhi, today started his election campaign from Tilak Nagar. There seems to be no progress in the case of Shanno Khan’s death on Friday. The Delhi police today again shied away from arresting the teacher Manju until the autopsy report of the schoolgirl is available. “It is really difficult for us to arrest somebody, especially a woman without substantial reasons. BJP general secretary and key poll strategist Arun Jaitely took the “Why BJP” campaign to sector 25, Noida, as he reached out to voters here on Monday evening. Pitching his arguments against a “weak and helpless” Prime Minister, Jaitely sought the support for BJP candidate Mahesh Sharma, chairman of Kailash Group of Hospitals, from Gautam Budh Nagar constituency to ensure the emergence of a “strong leader and decisive government”. Notices have been issued to the candidates for G.B. Nagar Lok Sabha seat by the district election office for using more vehicles at the time of filing nomination and mounting publicity campaigns without permission. From looting bikes and cars, the carjackers appear to have graduated to robbing tractor. Five months after the Central Bureau of Investigation (CBI) said that two men arrested by the Delhi police in 2006 were innocent, the city police on Tuesday sought to buttress its claim that the two were Al-Badr terrorists. Top ranking nuclear scientist and principal scientific adviser, Dr R. Chidambaram, has emphasised that India is on its way to transforming itself into a developed nation. He was delivering a key lecture today at the Delhi College of Engineering on "Nuclear Energy: Energy Security and Climate Change". A bus turned turtle after it collided with a truck on the Agra-Delhi national highway this morning, near village Sikri, about 20 km from here. Fourteen passengers are reported to have been injured in the mishap. Three children and three women were severely burnt when a high-tension wire fell on them in the Khoda area of Ghaziabad on Monday night, the police said today. Senior BJP leader Kusum Rai, considered to be close to rebel leader Kalyan Singh, is in trouble as the Noida police has filed a case against her for an allegedly provocative speech she made at an election rally. A man died after a gas cylinder exploded in his house here today. A 50-year-old man identified as Nasru was killed in the fire and declared brought dead at the hospital. According to Delhi Fire Service officials, the fire was reported from the slums in Shahbad Dairy area around 3.10 pm and 12 fire trucks were employed to douse the fire which took more than an hour. The police is ascertaining the cause of the fire. Meanwhile, in another incident, fire was reported at the Pitampura Metro station of Line 1 (Shahdara - Rithala) in the evening leading to disruption in Metro train services for some time. The fire erupted in an airconditioner in the signal room of the Metro station around 5.40 pm. According to officials, one fire tender doused the blaze but not before the signal system had been partially damaged. As a result the officials switched over to manual mode and services were started soon after. No casualty or injury was reported in the incident. 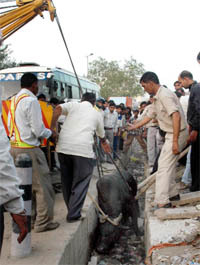 A 38-year-old man was crushed under the wheels of a private-run Blueline bus in the capital today morning. Bahadur, known by his first name only, lost his balance while trying to alight the bus near Sabzi Mandi area of Mallakaganj in north Delhi. “He fell on the road and came under the rear wheels of the bus. He was immediately rushed to the hospital by some onlookers, where doctors declared him dead,” a police officer said. 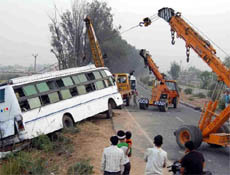 Naame Singh (37), the bus driver, surrendered at the Sabzi Mandi police station soon after the accident. have been directed to convene meeting of the PTA and decide issue of fee hike in a transparent manner. Those schools which have already hiked fee without the meeting of PTA would have to convene the meeting at the earliest and take an appropriate decision. In case the hiked fee is more than the hike decided in the PTA meeting, the difference would be refunded or adjusted accordingly. The minister stated that his department has been taking immediate action on submission of any complaint in respect of fee hike. He was expressing these views in a meeting of the All India Parents Association and Social Jurist. A delegation of the two organizations led by their president Ashok Aggarwal called on the minister to apprise him of the educational system in MCD schools and discuss the issues related to fee hike. While giving details of deteriorating condition in MCD schools, Aggarwal made a demand for taking over MCD schools by the city government. Only 165 candidates are left in the fray after final scrutiny of their nominations today. A total of 222 candidates filed nominations. Officials of the election department, Delhi government, checked their documents submitted at the time of filing nominations. While checking their documents and nomination forms, the officials found discrepancies in the nominations of 57 candidates. The majority of them are independents, said an official of the election department. Chandni Chowk has the maximum number of candidates where nominations of 42 contestants out of 55 have been accepted, the official said. Sitting MP from the constituency Sandeep Dikshit and his BJP challenger Chetan Chauhan are leaving no stone unturned to attract maximum voters, with both beginning their day at 5 am, while charges and counter-charges between them fly thick throughout the day, ending sometimes in the wee hours of the next day. While Sandeep mostly talks of development, recounts achievements of the Delhi government and future plans of the Congress, Chetan harps on the fact that East Delhi has been a ‘dumping ground’ of the Capital, with minimal work done in the past, besides reminding people about the Delhi government’s lackadaisical attitude over the recent fee hike by schools. “The state Congress government is despotic. On the one hand it talks about taking action against schools that have increased fees in an arbitrary way , on the other hand, it is silent about the withdrawal of the increased fees,” reminds Chetan, the first thing in his public meetings. He terms the behaviour of such schools as ‘Talibani’ and curses the Sheila government on the issue . Issues of non-development in East Delhi, inflation, and terrorism follow. Every public meetings of Chetan also has a housewife presenting before the people how the budget of her house has skyrocketed since the Congress government came to power. In contrast to this, Sandeep, being a sitting MP, recounts the roads and lights that he got built and repaired in the last five years. He is now promising the moon to the people if elected again, with the Congress considering enactment of the right to food law that will guarantee access to sufficient food to the marginalised sections of society. “After the passage of the right to food law in parliament, every family living below the poverty line, whether in rural or urban areas, would be entitled to 25 kg of rice or wheat per month at Rs 3 per kg. Subsidised community kitchens would be set up in all cities for homeless people by our government,” said Dikshit at a public meeting in Vishwas Nagar today. A school in every block of the country, a hospital at every district headquarters, and every BPL family being covered by the Rashtriya Swasthya Bima Yojana over the next three years, are other promises flowing out of Sandeep bag these days. Hauz Khas village comprises two different worlds. On the face of it are the swanky designer stores attracting the elite and foreign tourists. Deep inside, the village is a cluster of undeveloped narrow lanes and jhuggi jhoparies. Under the recently amended MPD, it has been provided for that urban villages become eligible for recognition as commercial areas. The MPD 2021 provides for full commercialisation of entire village abadi, both the rural and urban if 150 shops exist in 2.5 acres. Earlier, the number of shops required for full commercialisation was 300. By this way, villages like Shahpur Jat and Hauz Khaz have become eligible for full commercialisation. The local Congress MLA from Hauz Khas, Kiran Walia escorted Maken in the padyatra. “Urban villages have a special character because of which they are major sites of tourist attraction as well. The development of these areas has to be done with a lot of imagination. Indiscriminate sealing would have destroyed the Hauz Khas bazaar. We intervened at the time of sealing and stopped it from happening at the time when MCD refused to entertain the complaints of residents,” said Walia. She said Congress was planning to formulate new policies to further liberalise the regulation regarding urbanised villages. Meanwhile, residents of the area are still disgruntled. 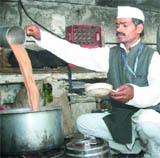 They said the small businessmen were not provided enough relief. “During sealing, they locked the small shops and allowed all the big designer stores to operate,” said Daya, a resident of the village. The state BJP vice-president, Dr Nand Kishore Garg, says that he has marked a complaint with the Election Commission, requesting it to take necessary action. Dr Garg added that the Congress has always played the politics of caste and religion, while applying the policy of divide and rule like the British did. Currently, when 27 crore people are living below poverty line, it is only the BJP which can usher in prosperity in the country as its slogan is ‘ Antyodaya’, said Dr Garg. On the same lines, the leader of the opposition in the Delhi legislative assembly Prof Vijay Kumar Malhotra said the Congress government, despite being in power for 55 years, had failed to contain poverty. Later, he attended public meetings at Subhash Nagar, Tagore Garden and Janakpuri (west). Mukhi was accompanied by MLA O.P. Babbar, area municipal councilor P.R. Sahni and hundreds of party workers. Addressing the gathering at Raghubir Nagar, Mukhi expressed concern at the rising sale of illicit liquor in the area. He blamed the policies of the excise department for the problem, and promised to stop the sale, if elected in the forthcoming elections. Mukhi also met a delegation of the Delhi School Van Operators Union & MCV Operators. The van operators apprised Mukhi of their problems. They complained that the Delhi government had issued deadline for them to convert their diesel vehicles to CNG by June 30, failing which their vehicles would be seized. Reacting on the issue, Mukhi termed the Delhi government’s order a ‘Tughlaki Farman’. He pointed out that earlier when the court had ordered the conversion of all diesel buses to CNG, the Delhi government had not only given sufficient time to the bus owners for the conversion, but had even exempted the CNG kits from Value Added Tax (VAT). “I don’t know why this step-motherly treatment is being meted out to the van operators,” Mukhi commented. There seems to be no progress in the case of Shanno Khan’s death on Friday. The Delhi police today again shied away from arresting the teacher Manju until the autopsy report of the schoolgirl is available. “It is really difficult for us to arrest somebody, especially a woman without substantial reasons. The autopsy report would provide us insight into the teacher’s role in her death. We should wait till then,” said a police official close to investigation. Shanno, a class II student of the MCD primary school in Bawana, died on April 17 after she was allegedly made to stand in the sun with bricks on her shoulders that led to her slipping into coma. Meanwhile, hundreds of protesters, mainly women, staged a demonstration outside the Delhi police headquarters at the busy ITO intersection demanding Manju’s arrest. They carried banners reading “Delhi Police Stop Shielding Accused of Corporal Punishment, Arrest Manju” and “Stop Corporal Punishment in Schools”. They left after about half an hour with the promise of justice from the senior police officials. In another development today, Municipal Corporation of Delhi said it is yet to reach a conclusion in its probe into the girl’s death as its vigilance department has sought more time to complete the inquiry. “The MCD is yet to give a clean chit to the teacher. The vigilance department, which is inquiring the incident, was to submit its report on Monday but now it has sought more time to complete the inquiry,” he said. Addressing the gathering, Jaitely took on Manmohan Singh and called him a “majboor” leader. “We have been inviting him to a debate against out prime ministerial candidate L.K. Advani. But he is never ready. He can only read out a written speech, he said. The BJP general secretary said that his government will provide cheap ration to the poor, grant one rank, one pension to the amend forces personnel, and would in no case impose high axes. Seeking votes for Mahesh Sharma, Jaitely said while people joined politics to become popular, the BJP candidate was already an achiever. “You all know his contribution to the medical field in the area”. Speaking earlier, Mahesh Sharma said Noida had provided him everything, success, fame and love of people during the last about 20 years. He had decided to join politics to serve the people still better. He had a dig at the law and order scenario in Noida. Notices have been issued to candidates of Congress, BJP, SP and BSP parties. According to addl district magistrate J.P. Arya, the expenses on publicity vehicles will be added to the candidates' election expenses. ADM Arya said BJP candidate Mahesh Sharma and SP candidate Narinder Bhatti have been issued notices for using more than permissible vehicles for publicity. BJP candidate had permission for five vehicles while SP candidate Narinder Bhatti had permission to use four vehicles. But both of them had used a large number of vehicles. Notices to BSP's Surinder Nagar and Congress's R.C. Tomar have also been sent for bringing a large convoy of vehicles at the time of filing nomination. Interestingly, BSP had permission to use three vehicles for publicity while Congress had not sought permission even for a single vehicle. The district administration is also getting all the election meetings video-graphed. About a dozen armed bandits overpowered farmers and looted jewellery from women and tractor from the farmers working in the field under Javer police station early on Monday at 1 am. When the farmers, who had been tied, informed the police about it the next morning, the police registered it as a theft case only. Shyamveer, Ramveer, Yoginder and Mukesh of Kundelkhand Mohjha along with their women folk were harvesting wheat from their fields with the help of tractor. At about 1 am, over a dozen bandits barged into their farm and started assaulting everyone and snatching ornaments. When farmers offered resistance, they were shown pistols and daggers and made captive. The criminals looted Rs 500, a tractor, a 50-litre cane of diesel and ornaments of women. A few neighbouring farmers accompanied them to Javer police station to lodge a complaint. On a written complaint of Puppu, son of Ashraf, police registered a case of theft. In another incident on Saturday, two bike-borne criminals looted about a dozen women who had gone to fields to collect fodder in Rabu Pura area. A week earlier also, about 15 women had been looted in jungles of Dhanora village. The Delhi police’s Special Cell, in a fresh affidavit filed in the Delhi High Court on Tuesday, said the two were in touch with a Pakistan-based terrorist. The Special Cell claimed that the men - Mohammed Arif Qamar and Irshad Ali - were in touch with Baig, a Kashmiri militant in Pakistan-occupied Kashmir who heads the Jammu and Kashmir Islamic Front. The Special Cell has claimed that the links to Baig were unearthed by late inspector M.C. Sharma, who was killed in a gun battle with militants last year. The police claimed that Sharma had found that Ali was in touch with Baig and other terrorists on January 23, 2006. However, the Special Cell in its chargesheet filed in a lower court on May 6, 2006, had not mentioned the duo’s links with Baig. The CBI in its closure report filed last November had concluded that the two were innocent. The probe agency had also recommended registering a case against three Delhi police officials for implicating the men by planting arms and explosives on them. The CBI said it had found nothing against the two arrested men. Qamar and Ali were arrested by the Special Cell from Mubarak Chowk on GT Karnal Road in north Delhi in February 2006 and have been in jail since then. The question, however, is how fast we will realise this goal. He said for India to become a developed nation "we need to evolve innovative strategies and achieve global competitiveness in a number of key sectors of our economy. The development of a country correlates very strongly with per capita energy consumption and as such for India to achieve a pre-eminence position as a developed nation, the energy consumption has to increase manifold. Energy security, therefore, is not merely desirable but an essential goal which we have to achieve without fail if we wish to realise our dream of India as a developed nation." Chidambaram stressed on the fact that there is not enough fossil fuel in the world and its rapid depletion is reflected in the surge of crude oil prices we have witnessed in the recent past. India being largely dependent on crude oil import for its present energy needs, it is all the more important for us to devise an effective energy strategy to fuel our economic growth without sacrificing the interest of environment. Renewable energy has a role to play, but we have technological bottlenecks to achieve a major share in meeting our country's energy demands. "In this context, nuclear energy becomes an inevitable option and if harnessed in the right earnest it shall play an important role in satisfying this surging energy demand," said Dr Chidambaram. Though the cost of building a nuclear plant is 30 per cent more than a coal-based one, the fuelling cost in a nuclear plant is proportionately lower and so, the cost balances out during the lifespan of the plant. Chidambaram informed that, "unlike fossil fuels, nuclear energy does not contribute to climate change, being a closed cycle for the nuclear plants. It is for this reason that the nuclear power is now recognized universally as an important mitigating technology in the context of climate change." The nuclear renaissance today in the already-developed countries is driven both by considerations of energy security and by the climate change threat. He said India has a three-stage indigenous nuclear power programme - pressurized heavy water reactors, fast breeder reactors and thorium-based reactors. Fast reactors used in the closed cycle mode provide the option for the full exploitation of the natural nuclear fuel resources. This is further enhanced by inclusion of thorium in the closed nuclear fuel cycle, making nuclear a near-Renewable energy resource. The Indo-US nuclear deal and the NSG waiver would make it easier to import the technology and fuel needed for the first stage of pressurized heavy water reactors and imported water-cooled reactors. However, India would continue intense research and development of fast breeder reactors and thorium utilization that constituted the second and third stages, thus closing the nuclear fuel cycle. A bus turned turtle after it collided with a truck on the Agra-Delhi national highway this morning, near village Sikri, about 20 km from here. Fourteen passengers are reported to have been injured in the mishap. The injured were taken to the Palwal Civil Hospital, from where they have been referred to Safdarjung Hospital in the national Capital. The incident occurred about 3 am when the bus after hitting a truck running ahead and lost its balance. The bus had a UP registration number. It was reported to be heading towards Delhi from Agra. According to officials, the children and the women were sitting on the rooftop of their house when the overhead high tension 11,000 volt transmission wire fell on them, severely burning them. Seema, Ruby, Nisha, all aged between 25 and 30 years, and their children Tarun, Himanshu and Priyanshu, while sitting on the rooftop of their house, had rested their legs on the iron grill of the terrace. As the wire suddenly snapped and fell on the house, the current began to flow in the iron grill and gave them a shock. The six, critically injured, were rushed to a local hospital from where they were referred to Delhi’s Safdarjung Hospital. The police on Monday night registered a case against Kusum Rai for delivering "communally provocative" speech, under various sections of the Indian Penal Code and the election law. Rai arrived here with senior BJP leader Arun Jaitley and addressed a rally for the party candidate from Gautam Budh Nagar, Mahesh Kumar Sharma. The incident took place when Chhote Lal was illegally refilling the liquid petroleum gas (LPG) from a gas cylinder in his house at the Nurpur locality of Ghaziabad. “When he was refilling gas from a domestic cylinder weighing 14.3 kg to an illegally manufactured five kg cylinder, the domestic cylinder exploded and Chhote Lal blew into pieces,” a police officer said.